VANCOUVER, BC, March 4, 2013 – Mirasol Resources Ltd. (TSX-V: MRZ, Frankfurt: M8R) Mirasol has completed a 25 hole, 2,599 metre reconnaissance drill campaign and a follow-on 1,216 metre Phase 2 trenching program at the Rio Seco prospect at its 100 % owned Claudia gold silver project in Santa Cruz province, Argentina. The Claudia project is contiguous with Anglogold Ashanti’s Cerro Vanguardia operating gold-silver mine hosted within the prolific Deseado Massif volcanic province. Nine of 25 diamond drill holes at Rio Seco (Figure 1) returned anomalous gold and silver assays (Table 1). The greater than 1 gram per tonne (g/t) gold equivalent (grams of gold + (grams of silver/55) at 0.25 g/t gold equivalent cut-off), confirm widespread anomalous precious metal mineralization at Rio Seco. 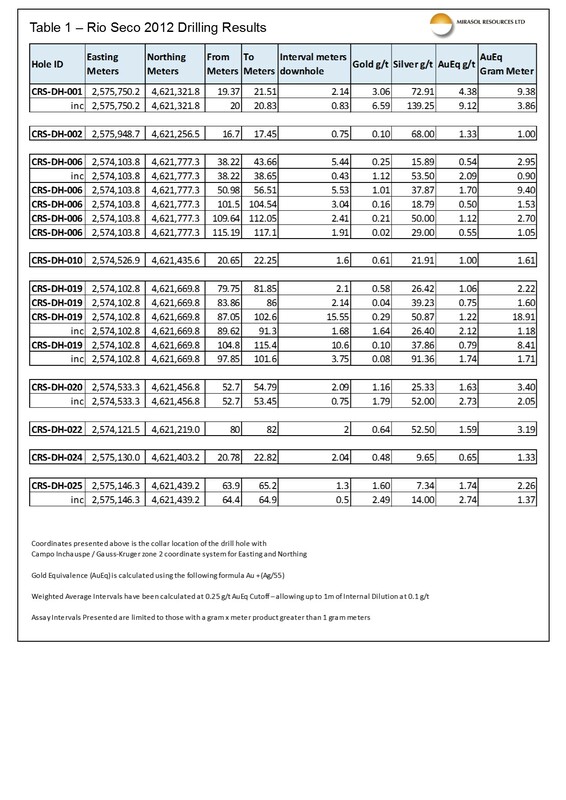 Better drill results include individual assay of up to 0.83 metres at 6.59 g/t gold and 139.3 g/t silver (9.12 g/t gold equivalent) and broad intersections of anomalous gold and silver up to 15.3 metres of 0.29 g/t gold and 50.9 g/t silver (1.22 g/t gold equivalent). The majority of anomalous drill results are clustered around the structural intersection of the “Loma Alta Trend” and “Rio Seco Main” veins (Figure 1), which center on a covered resistive geophysical anomaly, the “Oculto Zone”. The overall structural setting of this zone is interpreted by to be a dilational jog, a structural setting which hosts economic concentrations of precious metals elsewhere in Santa Cruz province. 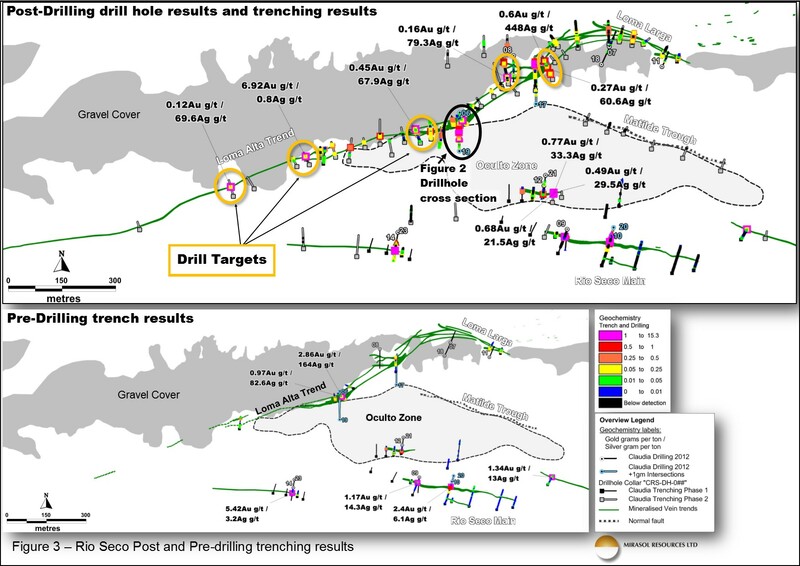 Significant drill results for the Rio Seco program were returned from holes CRS_dh_06 and -19 (Figure 2) on the Loma Alta Trend and at the edge of the Oculto Zone, and were drilled on-section beneath the best Phase 1 trench result of 1.8 metres at 1.19 g/t gold and 73.7 g/t silver (news release March 5, 2012). A shallow hole, CRS_dh_06, intersected a series of high-level epithermal veins and vein-breccia, approximately 30 metres below the trench, over an estimated true width of 15 metres. Down hole intersections in this zone include 5.5 metres at 1.01 g/t gold and 37.9 g/t silver (5.5 meters of 1.70g/t of gold equivalent), and the majority of the zone was gold and silver anomalous. The deeper hole, CRS_dh_19, intersected the same vein zone at approximately 80 metres below the trench. Here the vein zone has an estimated true width of 28 metres and best down hole intersection returned 15.5 metres at 0.29 g/t gold and 50.87 g/t silver (15.5 meters of 1.22 g/t of gold equivalent).. 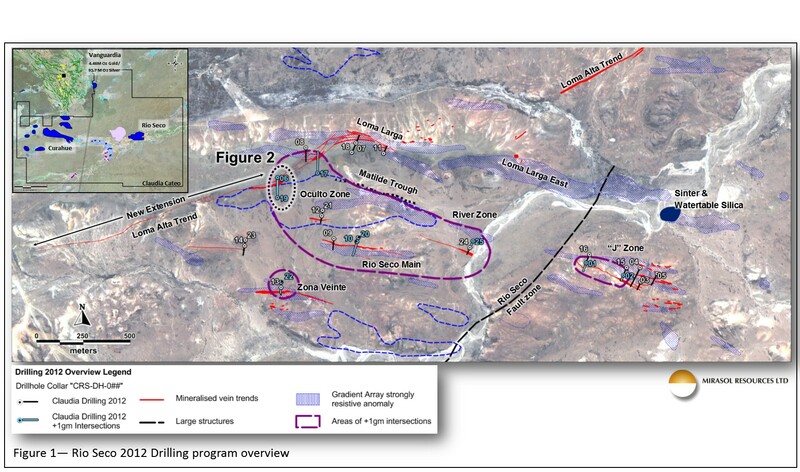 These drill results show increasing width of the vein zone at depth and increasing contained precious metals expressed as gram-metres of gold equivalent (width of grade interval multiplied by assayed gold + (silver/55)). 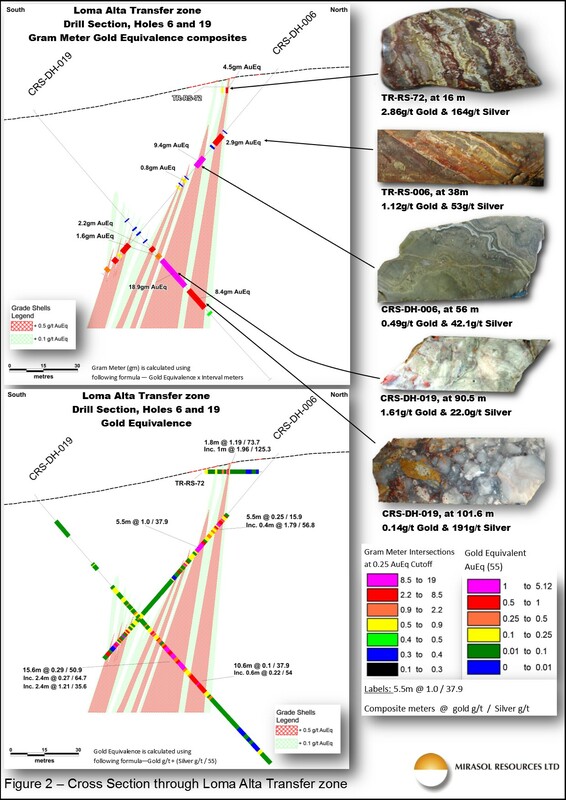 This vectoring-to-depth and the high-level epithermal vein textures suggest that even the deepest drilled intersections are near the top of the projected mineralized zone and that deeper drilling is warranted to test for higher-grade gold and silver. The Phase 2 trenching program completed at Rio Seco totaled 1,216 metres in 31 trenches (Figure 3). Phase 2 trenching was largely focused along the Loma Alta Trend but also tested a number of sites at the edge of the Oculto Zone. Importantly, Phase 2 trenching was successful in extending the Loma Alta vein trend for an additional 900 metres to the southwest, and returned individual assays of up to 6.9 g/t gold and up to 448 g/t silver, which has defined multiple new drill targets. Drilling and the subsequent Phase 2 trenching has improved the understanding of the structural controls on mineralization in the Rio Seco vein zone, and provided focus and justification for further drilling and the testing of new targets at the Loma Alta and Oculto zones. Mirasol’s Exploration focus has shifted to the Curahue trend, located in the western sector at Claudia, where extensive trenching, surface mapping and new Gradient Array IP electrical geophysical survey is underway. Mirasol will update on these results as they are received. Mirasol’s in-house quality assurance procedures identified potential analytical laboratory issues with some of the original assay results delivered by the independent assay laboratory. Mirasol worked with the laboratory to re-analyze sample pulps, and in some cases re-sampled the core intervals, in order to resolve these issues and to ensure compliance under best practices and that industry- standard QA/QC were met. Stephen C. Nano, Vice President of Exploration for Mirasol, is the Qualified Person under NI 43-101 who has approved the technical content of this news release. Exploration at the Claudia Project is supervised by Stephen C. Nano, Vice President of Exploration, who is the Qualified Person under NI 43-101. All technical information for the Company’s projects is obtained and reported under a formal quality assurance and quality control (QA/QC) program. All Drill Rock chip and stream sediment samples are collected under the supervision of Company geologists in accordance with standard industry practice. Samples are dispatched via commercial transport to an ISO 9001:2000-accredited laboratory in Argentina for analysis. All rock chip and drill samples are submitted to the Laboratory with independently sourced, accredited standard and blanks and where appropriate duplicate samples to facilitate monitoring of laboratory performance. Certified Results are examined by an independent qualified consultant to ensure laboratory performance meets required standards.